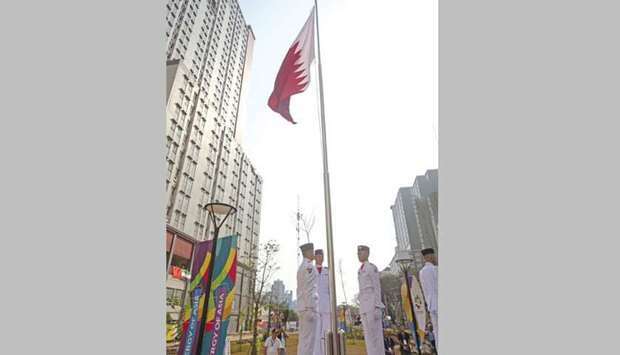 The Qatari flag was raised in the Athletes’ Village at the Asian Games yesterday, welcoming Team Qatar and marking the start of the team’s highly-anticipated competitions. The Athletes’ Village brings together competitors from around Asia in celebration of what is known to be the largest multi-sport event in the world after the Olympic Games. To show support to Team Qatar, Qatar Olympic Committee (QOC) secretary-general Jassim al-Buenain, National Sports Federations presidents and members of the administrative delegation attended the flag raising ceremony. The energy of Asia can be felt in the Athletes’ Village as 45 participating nations were welcomed and, during the next two weeks, athletes will have the opportunity to share their diverse cultures, languages and histories. “It is incredible seeing all of these athletes coming from all around Asia to compete at one prestigious event. Being part of Team Qatar and representing our country is a huge responsibility, but I’m excited to go head-to-head with Asia’s best athletes and make Qatar proud,” said Team Qatar’s swimmer Abdelaziz al-Obaidly, who will be participating at an international multi-sport event for the first time. The Athletes’ Village at Kemayoran, North Jakarta, will accommodate 14,500 athletes and officials, while the Athletes’ Village inside the Jakabaring Sports City at Palembang will house 3,000 athletes and officials for 11 sporting disciplines.